IDC cut its expectations for the PC market, worldwide shipments are now expected to grow by 4.2 percent this year, down from a February forecast 7.1 percent. The market research firm blames sluggish demand, the modest growth in the commercial sector, the cautious outlook from PC makers, the Japan earthquake and nuclear disaster, the uprisings in Arab countries, and reduced economic projections. 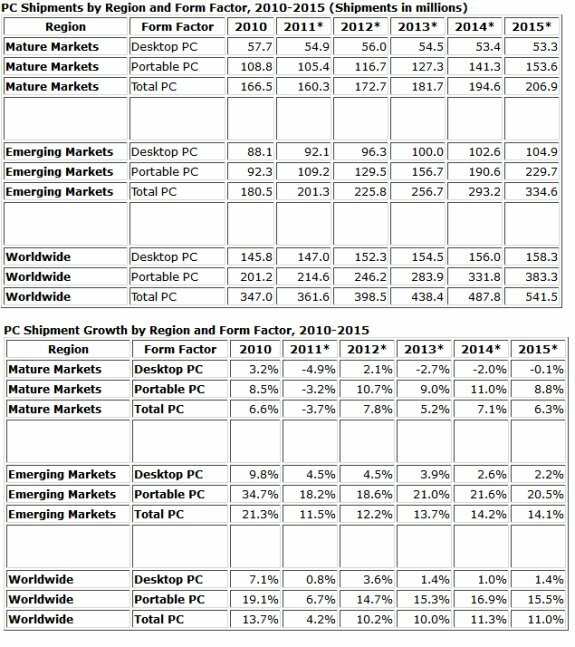 Worldwide PC shipments are now expected to grow by just 4.2% in 2011, down from a February forecast of 7.1%, according to the International Data Corporation (IDC) Worldwide Quarterly PC Tracker. A combination of declining first quarter shipments, an increasingly conservative economic outlook, relative saturation among developed market consumers, and competing products will lead to slow growth in 2011 before a rebound in 2012. For 2012 through 2015, growth is still expected to fall in the 10 to 11% range. Consumer PC purchases have been a cornerstone of PC growth over the past five years. During this time, a transition to low-cost portables helped drive purchases by new users in emerging markets as well as replacement and secondary systems in more mature markets. Consumer PC shipment growth averaged 18.9% from 2005 to 2007, almost 7% faster than commercial shipments. During 2008 and into 2009, consumer growth was actually faster at more than 21% while commercial growth fell below 3% in 2008 and then dropped to -10.5% during the recession in 2009. The growth in 2009, which was remarkably independent of the economic pressures following the housing bubble, banking crisis, and related recession, was largely fueled by the mini notebook (also known as netbook) boom. Consumers in mature regions snapped up over 19 million mini notebooks in 2009 vs. just 6.6 million the prior year, and the jump accounted for over 80% of volume growth in the segment. Emerging regions also got a bump from mini notebooks, which added 7 million units in 2009, accounting for roughly half of growth in portable PCs. However, the appeal of low prices for mini notebooks has given way to a number of factors, including relative saturation following this boom cycle, recognition of their limitations, and better competition from both mainstream notebooks and media tablets, which increased 31 million and 17.9 million units in 2010 respectively vs. just 1.3 million for mini notebooks. "Consumers are recognizing the value of owning and using multiple intelligent devices and because they already own PCs, they're now adding smart phones, media tablets, and eReaders to their device collections," said Bob O'Donnell, vice president, Clients and Displays. "And this has shifted the technology share of wallet onto other connected devices." Consumers are also increasingly affected by the prolonged recession – affecting not just housing, employment, equity markets, and GDP, but also rising energy and food prices, relatively high debt, and tight credit – much of which hits directly at consumer discretionary spending. The potential boost to the PC market from thinner designs, longer battery life, instant on, touch, and other improvements will likely not be widely available until 2012, and will have to address price-sensitive buyers in order to drive higher levels of growth. In fact, the appeal of these future enhancements could be seen as another motive for consumers to delay the purchase of a new PC until they are available and to focus on other products in the meantime. First quarter 2011 PC shipments were down 1.1% from the prior year, with a decline of 4.4% in consumer shipments that was only partially offset by 3.0% growth in commercial segments. However, the decline in consumer shipments was particularly acute in mature regions, with double-digit declines in Western Europe, the U.S., and Canada. Relatively strong growth in the second quarter of 2010 is likely to keep second quarter 2011 growth low. This trend in consumer growth, along with only modest growth in the commercial sector, a cautious outlook from PC makers, disruptions including the Japan earthquake and nuclear disaster, the Arab Spring, and reduced economic projections (including government stimulus) will keep overall growth in single digits the rest of 2011. Nevertheless, IDC expects significant growth in both consumer and commercial markets to continue beyond 2011. New designs, chips, operating systems, features, and services, along with falling prices will continue to make PCs more powerful, affordable, and functional than ever before. Despite incursions by smartphones and media tablets, PCs have a large user base and ecosystem, and continue to represent the most comprehensive and affordable computing platform. Adoption by new users in emerging regions as well as replacements in more mature markets will continue to drive double-digit growth through the end of the forecast. "The PC market has definitely hit a slow patch," said Loren Loverde, vice president, Worldwide Consumer Device Trackers. "Nevertheless, the long-term growth drivers – first among which are growth in emerging markets, declining prices, and growing functionality – remain intact, and the product and design innovations underway will keep PC growth healthy in the long term."